Zakynthos is an island bursting with things to see, explore and enjoy - from the beautiful beaches, lovely traditional villages, picturesque mountain scenery, watersports, sights such as the Shipwreck and Venetian Castle and as if that wasn't enough there are also several interesting museums; an ideal way to learn more about this wonderful place and its distinguished residents. The two best known museums are the Zakynthos Museum of Byzantine & Post- Byzantine Art and the Solomos & Kalvos Museum, both of which are located in Zante town, the capital of the island. The Byzantine Museum has many interesting exhibits but is best known for the hagiographies by prominent Zakynthians, as well as exhibits ranging from the 12th - 18th Centuries. The Solomos & Kalvos Museum features the personal artefacts of famous Zakynthians. Another museum of interest is the museum of Grigorios Xenopoulos a famous playwright, and journalist; the museum houses many of his personal items, manuscripts and furniture. 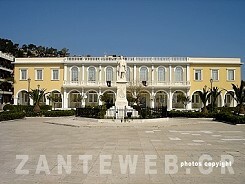 On the outskirts of Zante Town, in Bohali, is the Naval Museum reputed to have the best collection of Byzantine vessels worldwide. Please browse the links for more details about each museum & remember they are great places to visit, especially to be out of the sun during its hottest hours.